Batali was born in Seattle, Washington on September 19, 1960, to Marilyn (LaFramboise) and Armandino Batali, who founded Seattle's Salumi restaurant in 2006. His father is of Italian descent and his mother is of part French-Canadian ancestry. Batali attended Rutgers University in New Brunswick, New Jersey while working as a cook at the pub/restaurant Stuff Yer Face. In 1994, he married Susi Cahn. He is son-in-law to Miles and Lillian Cahn, founders of Coach Inc. Mario Batali's brother Dana Batali was Director of Pixar RenderMan development from 2001 to 2015. At 29, Batali was a sous chef at the Four Seasons Biltmore after previously working as a sous chef for the then Four Seasons Clift Hotel San Francisco, (since 1995, known as "The Clift", under changed ownership). Early in his career, Batali worked with chef Jeremiah Tower at his San Francisco restaurant, Stars. Stars was open from 1984 until 1999 and is considered one of the birthplaces of the institution of the celebrity chef. 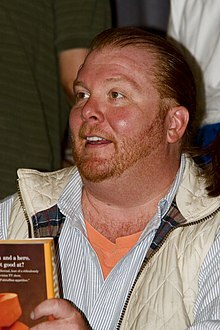 Batali appeared in the Food Network show Molto Mario  which aired from 1996 to 2004 and made Batali a household name and popularized the Food Network. In 1998, Batali, Joe Bastianich and Lidia Bastianich formed the B&B Hospitality Group, also known as Batali & Bastianich Hospitality Group. The flagship restaurant for B&B is Babbo Ristorante e Enoteca in New York City which has a Michelin star. In 2012, a lawsuit was settled by Batali (and B&B) with 117 members of the restaurant staff, who alleged that the Batali organization had skimmed a percentage of the tip pools in his restaurants over a period of years. Batali is a critic of hydraulic fracturing, commonly known as fracking, a method of natural gas extraction. He has signed onto the cause of Chefs for the Marcellus, whose mission is to "protect [New York's] regional foodshed from the dangers of hydraulic fracturing for natural gas (fracking)." In May 2013, Batali co-wrote an opinion article with chef Bill Telepan for the New York Daily News, in which the two wrote that "Fracking ... could do serious damage to [New York's] agricultural industry and hurt businesses, like ours, that rely on safe, healthy, locally sourced foods. "Batali was the subject of a 2007 book titled "Heat" by Bill Buford which detailed his philosophy to various aspects of social activism as well as cooking and life. Batali served as an ambassador and on the board of directors for The Lunchbox Fund, a non-profit organization which provides a daily meal to students of township schools in Soweto, South Africa. As of December 2017, Batali released in response to the sexual misconduct allegations, he would step down from his role with this organization. In 2008, Batali and his wife Susi Cahn founded the Mario Batali Foundation, funding various children's educational programs and pediatric disease research. He supports the practice of Transcendental Meditation through the David Lynch Foundation. In a 2012 interview, Batali said that good Italian cooking was characterized by simplicity, an insight he attributed to his time working at a restaurant in Borgo Capanne, Italy. On December 11, 2017, restaurant news website Eater reported that four women accused Batali of sexual harassment and sexual misconduct. By the following day four more women had come forward. Batali took a leave of absence from his position at the management company Batali & Bastianich Hospitality Group. Producers of ABC's The Chew asked him to step aside temporarily, while his fellow co-hosts publicly addressed the allegations on air, and he was fired from the show on December 14, 2017. Food Network halted plans to release episodes of his television show Molto Mario after the allegations. Target announced it pulled Batali's pasta sauces and cookbooks out of sales. In May 2018, more accusations of sexual misconduct against Batali were aired on an episode of 60 Minutes, and the New York Police Department confirmed it was investigating Batali for his past behavior including an alleged assault that took place at The Spotted Pig, a restaurant where Batali was an investor. Batali denied an allegation of sexual assault, but said "My past behavior has been deeply inappropriate and I am sincerely remorseful for my actions." Days later, Batali's company B&B Hospitality Group announced it would be closing its three Las Vegas Strip restaurants after the Las Vegas Sands Corp. terminated the companies' relationship. In March 2019, Mario Batali surrendered ownership of his stakes in Batali & Bastianich Hospitality Group, a partnership between Batali, and the Bastianich family, including Joe and Lidia Bastianich. He also sold his minority ownership in Eataly, an Italian food marketplace. The Bastianichs said B&B Hospitality Group's name will change. Batali was the first chef to surrender ownerships in all his restaurants after reports of sexual misconducts. Molto Mario 1996–2004 Food Network host a culinary tour of Italy, hosted by Batali. Mediterranean Mario 1998 Food Network host a culinary tour of Morocco, Spain, France, Greece, hosted by Batali. Mario Eats Italy 2001–2002 Food Network host a culinary tour of the Italian countryside. Ciao America with Chef Mario Batali 2003 Food Network host a culinary tour of the Italian in America, only three episodes. Mario, FULL BOIL 2007 Food Network A one hour documentary special, following Batali and Bastianich opening an Italian restaurant in NYC (Del Posto). Emeril Live 2006 Food Network guest appearance "Italian Favorites with Mario Batali"
Anthony Bourdain: No Reservations 2005 Travel Channel guest appearance Season 1, Episode 3, "New Jersey". Worth It 2017 BuzzFeed guest appearance Season 2, Episode 5, $2 Pizza vs. $2,000 Pizza in New York City. 1998 – "Best New Restaurant of 1998" from the James Beard Foundation for "Babbo Ristorante e Enoteca"
2004 – Three Stars from The New York Times for "Babbo Ristorante e Enoteca" from Ruth Reichl. 2008 – "Best Restaurateur" for Joe Bastianich/Mario Batali for Babbo Ristorante e Enoteca from the James Beard Foundation. Culinary Hall of Fame Induction. ^ a b Gates, Henry Louis, Jr. (2010). Faces of America: How 12 Extraordinary People Discovered their Pasts. NYU Press. p. 129. ISBN 978-0814732649. ^ "Batali, Mario". Current Biography Yearbook 2011. Ipswich, MA: H.W. Wilson. 2011. pp. 54–57. ISBN 9780824211219. ^ "Disgraced celebrity chef Mario Batali surrenders ownership stakes in all of his restaurants". ^ "Restaurants | Mario Batali". MarioBatali.com. Retrieved 2018-09-19. ^ Inzitari, Vanessa. "Check Out Mario Batali's Westport Restaurant". The Westport Daily Voice. Retrieved July 13, 2012. ^ Moskin, Julia (March 6, 2019). "Mario Batali Exits His Restaurants". The New York Times. Retrieved 7 March 2019. ^ Roger Downey (December 25, 2002). "A Batali Family Christmas". Seattle Weekly. Archived from the original on November 4, 2010. Retrieved April 3, 2012. ^ "Hall of Fame". Stuff Yer Face. Archived from the original on July 27, 2017. Retrieved February 7, 2018. ^ "Who is Mario Batali's wife, Susi Cahn?". Newsweek. 2017-12-11. Archived from the original on January 7, 2018. Retrieved 2017-12-14. ^ Coren. "CNN Transcripts Interview with Mario Batali". CNN. Retrieved 2012-09-14. ^ "Clift Hotel's debt sold". San Francisco Chronicle. February 21, 1995. Retrieved 2017-03-13. ^ "Jeremiah Tower, a Forgotten Father of the American Food Revolution". The New Yorker. Retrieved 2018-06-10. ^ Keil, Braden (2007-09-05). "Food Net Chef Mario Flames Out". New York Post. Retrieved 2007-09-17. ^ "Joe Bastianich, restaurateur and winemaker". Las Vegas Sun. 2009-06-12. Retrieved 2017-12-14. ^ "First Look at La Sirena, the Latest From Mario Batali and Joe Bastianich". New York; Grub Street. Retrieved 2017-12-14. ^ a b c "Mario Batali Out as Co-Host of 'The Chew' Amid Sexual Harassment Allegations". Variety. December 11, 2017. Retrieved December 13, 2017. ^ "Celebrity Chef Mario Batali Settles Lawsuit With His Waitstaff". NPR.org. Retrieved 2017-12-14. ^ Weiser, Benjamin. "Mario Batali Agrees to $5.25 Million Settlement Over Employee Tips". The New York Times. Archived from the original on February 2, 2018. Retrieved 2018-02-06. ^ "Chefs for the Marcellus: Look Who's Signed On". Archived from the original on May 28, 2013. Retrieved May 30, 2013. ^ "Chefs for the Marcellus: About Us". Archived from the original on 26 May 2013. Retrieved 30 May 2013. ^ Batali; Telepan. "Fracking vs. food: N.Y.'s choice". New York Daily News. Retrieved 30 May 2013. ^ a b c "Mario Batali's Businesses Distance Themselves From His Name". Eater. Vox Media. Retrieved 2017-12-13. ^ Schneier, Matthew. "The Transcendentalists". Retrieved 25 December 2013. ^ "For Some of New York's Most Successful, Transcendental Meditation". The New York Observer. 2014-08-06. Retrieved 2018-02-06. ^ Anna Coren. "Transcript: Interview with Mario Batali". Talk Asia. CNN International. ^ Plagianos, Irene; Greenwald, Kitty (December 11, 2017). "Mario Batali Steps Away From Restaurant Empire Following Sexual Misconduct Allegations". Eater. Vox Media. ^ Disis, Jill (December 11, 2017). "Mario Batali: 'The Chew' host steps away amid sexual misconduct allegations". CNN. Retrieved December 13, 2017. ^ Vagianos, Alanna (2017-12-12). "Now It's 8 Women Accusing Chef Mario Batali Of Sexual Misconduct". HuffPost. Retrieved 2017-12-13. ^ Hauser, Christine; Severson, Kim; Moskin, Julia (2017-12-11). "Mario Batali Steps Away From Restaurants Amid Sexual Misconduct Allegations". The New York Times. ISSN 0362-4331. Retrieved 2017-12-14. ^ "The Chew Co-Hosts Address Mario Batali's Sexual Misconduct Allegations On-Air". People. 2017-12-13. Retrieved 2017-12-14. ^ "Celebrity chef and 'The Chew' co-host Mario Batali fired by ABC following sexual misconduct allegations". KTRK-TV. December 14, 2017. Retrieved 15 December 2017. ^ "Food Network Freezes Plans to Release New 'Molto Mario' Episodes". Eater. Retrieved 2017-12-14. ^ "Target Is Pulling Mario Batali's Products From Its Stores". Eater. Retrieved 2017-12-14. ^ "Mario Batali Products Pulled From Target Amid Sexual Misconduct Allegations". San Francisco Chronicle. Retrieved 2017-12-14. ^ a b Anderson Cooper (May 20, 2018). "Mario Batali and the Spotted Pig". 60 Minutes. CBS News. ^ Al Mancini, 3 Mario Batali restaurants on Las Vegas Strip to close, Las Vegas Review-Journal (May 25, 2018). ^ a b c Moskin, Julia (2019-03-06). "Mario Batali Exits His Restaurants". The New York Times. ISSN 0362-4331. Retrieved 2019-03-07. ^ Thorn, Bret (March 6, 2019). "Mario Batali out at B&B Hospitality Group". Nation's Restaurant News. Retrieved March 6, 2019. ^ "Chef Mario Batali - Show Molto Mario - Show List A to Z - TV". Food Network. Retrieved 2010-09-21. ^ "Food Network: Ciao America with Mario Batali". September 24, 2003. Archived from the original on September 24, 2003. ^ "Healthy Recipe Collections, Party Ideas, Quick & Easy Recipes". Food Network. Retrieved 2010-09-21. ^ "Anthony Bourdain: No Reservations: New Jersey". TV.com. Retrieved 2010-09-21. ^ Stanley, Alessandra (2010-02-09). "Henry Louis Gates Jr. Looks at Americans' Genealogy". The New York Times. ISSN 0362-4331. Retrieved 2019-03-11. ^ "BuzzFeed's food-fest series 'Worth It' has racked up 280 million views — and cable TV should be worried". Business Insider. Retrieved 2017-12-14. ^ "2008 James Beard Awards, Final Nominees Announced". Eater NY. Retrieved 2018-01-07. ^ "Mario Batali Inducted". www.culinaryhalloffame.com. Wikimedia Commons has media related to Mario Batali.